New Community Series---a high-impact tool for experiencing the transforming power of God's Word. This cutting-edge series lets you explore life-changing topics from a biblical perspective in community with others in your small group. Challenging questions encourage you to reflect on Scripture and its impact on your life, both as an individual and as part of a community of Christ followers. - Publisher Face the Tough Times with Confidence The question is not, 'Will I face challenges?' The issue is, 'How will I deal with the tough times that come my way?' No one travels far down the road without confronting the sobering reality that life can be hard. The book of Nehemiah is a case study in overcoming life's challenges. Wave after wave of pain pounded on the shores of Nehemiah's life, but he kept standing strong. A tsunami of relational, financial, and spiritual attacks came, but he withstood it all in the power of God. As we meditate on Nehemiah's story, we discover the hope and victory that come when we walk in God's wisdom through the challenges of life. 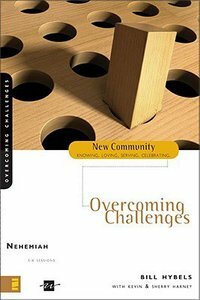 About "Nehemiah - Overcoming Challenges (New Community Study Series)"
Face the Tough Times with Confidence The question is not, 'Will I face challenges?' The issue is, 'How will I deal with the tough times that come my way?' No one travels far down the road without confronting the sobering reality that life can be hard. The book of Nehemiah is a case study in overcoming life's challenges. Wave after wave of pain pounded on the shores of Nehemiah's life, but he kept standing strong. A tsunami of relational, financial, and spiritual attacks came, but he withstood it all in the power of God. As we meditate on Nehemiah's story, we discover the hope and victory that come when we walk in God's wisdom through the challenges of life. This cutting-edge series is a high-impact tool for experiencing the transforming power of God's Word. You.ll explore life-changing topics from a biblical perspective in community with others in your small group. Challenging questions will encourage you to reflect on Scripture and its impact on your life, both as an individual and as part of a community of Christ followers.